The Mets continue to “improve” the team by bringing back most of the players from last year’s roster. Source: #Mets bringing back free-agent reliever Fernando Salas. Deal will be pending physical. 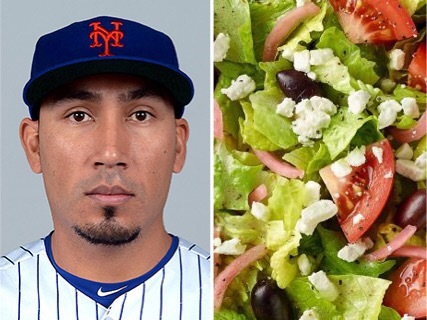 This time the Mets re-signed Fernando Salas aka Fernando Salad. Salad was the reliever Sandy Alderson acquired last August from the Angels. He was useful in his short stint with the Mets posting a 2.08 ERA over 17.1 innings. His actual 2017 salary hasn’t been released yet, but knowing the Mets it can’t be that much money. Signing Fernando on a one year deal sounds great to me. He’ll gobble up some late innings, and he’ll strike some guys out (8.9 K/9 in his career). It’s not a major bullpen improvement considering he was part of last year’s crew, but as long as we re-sign Jerry Blevins I’ll have some confidence in the group of guys we’ve assembled for the 2017 pen. As I said earlier today, it’s time to bring back Jerry Blevins. No more messing around. Sign Blevins Sandy. Get it done.